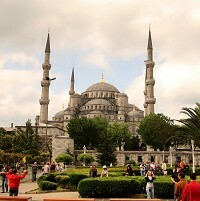 The tourism ministry in Turkey is spending £60 million to promote the European country as a popular holiday spot. The multi-million pound marketing campaign has been launched to take the total visitor numbers to the country to 31 million by the end of this year, Tayfun Senerkul, head of the Asia Pacific and Middle East department of Turkey's General Directorate of Promotion, told Hurriyet Daily News. As part of the marketing campaign, pictures of Turkey's famous beach resorts and ancient heritage are now appearing on banners and billboards in popular shopping districts across the world and foreign TV channels to lure more and more visitors to the country. The total number of people visiting the country rose from 13.2 million in 2002 to 28.6 million by the end of 2010. The increase in visitor numbers could have also led to a rise in the number of people taking out travel insurance. Basaran Ulusoy, chairman of Turkish Association of Travel Agents, told the news provider: "Turkey will be promoted in 153 different fairs in 61 countries this year. "Turkey became one of the top destinations globally thanks to international promotion campaigns."